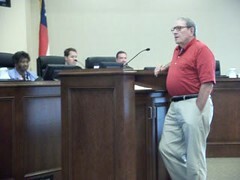 County resident Ernest McDonald laid out a list of issues he said the county hasn't addressed correctly. He said it wasn't anything personal. He wasn't mad. He just thought there were some issues that needed to be addressed. We met every person involved. The state, the high pressure gasline.... The telephone buried cable people, they came. The county engineer came.... And we all agreed.... Put stakes in the ground.... The stakes had rotted down. The County Engineer was missing from the meeting. 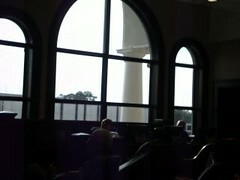 It's a bit hard to see in the picture, but there are only two heads in front of the glaring window, and the Engineer would be the third head in the middle.